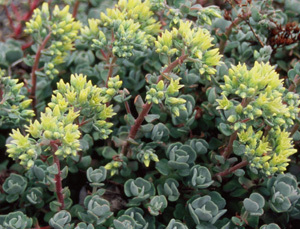 Joy Creek Photo Archive (c) all rights reserved The frosted gray succulent leaves of Sedum oregonense (Form 1) are infused with a blush of pink. The stems are also pink. The starry flowers have yellow anthers. From a collection from southern Oregon taken by plantsman Ron Ratko.